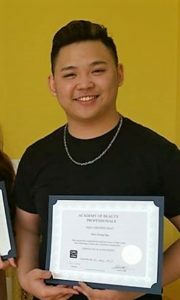 Hieu Ngo is one of Appleton’s most recent Nail Tech graduates. We asked him a couple of questions about his experiences with the Academy of Beauty Professionals, and here’s what he had to say! “I found that this Academy is a professional place. I decided to learn how to do nails and become a manicurist, and I really enjoyed it. All the staff and instructors are very friendly and enthusiastic. Why did you choose to be a manicurist? Our next session of Nail Tech classes begins June 19th! Click here to learn more about the program. Posted in Beauty School, Nails, Testimonials.